Typically, the holidays are one of my busiest seasons for gift styling. It’s when I offer the most workshops, provide lots of private lessons and wrap a crazy amount of presents for clients. This year, though, there will be none of that. While I don’t plan on taking much time off from blogging, I will not be offering any gift wrapping services or workshops for the next few months. As some of you may be aware, I’m having a baby. Soon. It’s probably one of the only things that could make me close up shop during my busiest time of year. Don’t fret. 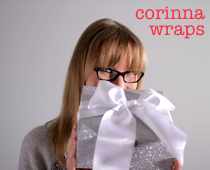 I’ll be here on the Corinna Wraps blog, posting as many great gift wrapping ideas and tips as I can manage. Through new posts as well as the archives, you’ll have everything you need to guide you through gift wrapping your prettiest presents this Christmas. So check back often from now until Dec. 25th (and beyond, of course). I’ll be here.